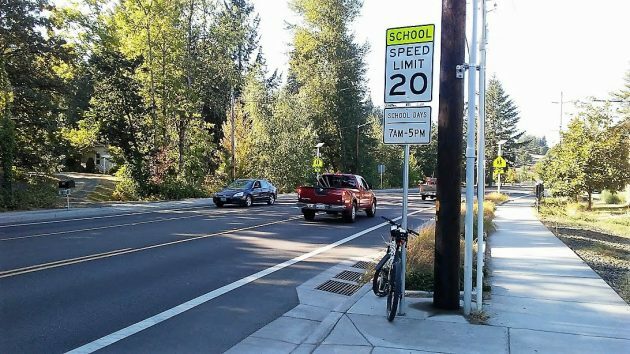 It is just before 5 p.m. on the first day of school, so those drivers on North Albany Road presumably are observing the 20 mph limit, even though as far as the eye can see, there’s a total absence of pedestrians connected to any school. 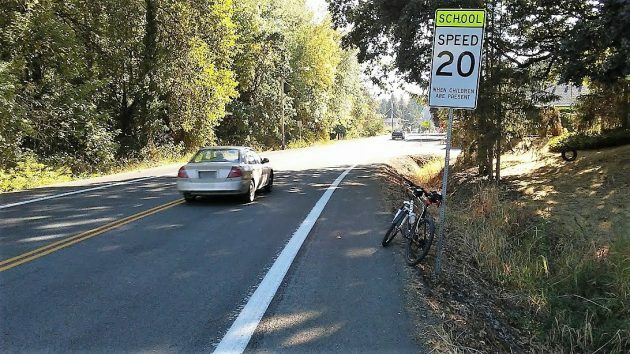 I took the photo Tuesday to illustrate the stupidity of our present school speed zone law. So exactly when are children “present”? ODOT says it’s when they are in a crosswalk or waiting on the curb or shoulder to cross, or when a crossing guard is present. So evidently, under the law, children are not “present” even when dozens of them are walking along without showing any signs of wanting to cross. This makes no sense at all. A normal person driving along Quarry Road, for example, would consider children to be present when he sees a bunch of them near the road, regardless of what they were doing. The other thing that makes absolutely no sense is to impose a ridiculously low speed limit on major roads when there are no children around at all — no one waiting to cross, no one just ambling along, no one goofing off with his friends. As, for example, on Southeast Waverly Drive and Northwest North Albany Road almost any time of the day. Ominously, ODOT warns online that violating the school zone speed can cost you as much as $870. All the more reason to have a sensible law. A sensible law would be what he had before lawmakers screwed things up in 2005. The signs warned us to slow down to the posted school speed when children were around, meaning when drivers could see children near the road, or in it. On Nothwest Quarry Road, near a crossing to and from North Albany Middle School. Has the rate of problems decreased since the change was installed in 2005? For the present school speed zones would authorities at least erect an “End” sign. Most every zone area at Albany schools has a beginning but none let the driver know where it ends down the road! Part of the school zone process would be to educate the children to “looking before leaping.” I frequently pass by Memorial & West Albany HS in a week & children can be seen just stepping off into a crosswalk with “mobile device” in hand & not even giving a glance at traffic. Better yet, why not escape this so called misery you describe and relocate to a red state where you’ll no longer be the minority. There, you’ll be amongst today’s GOP who mostly blindly watch while their commander in chief and congress majority perform the seven deadly sins, lie, cheat, deceive, subvert, Faustian bargain, and ignore the constitutional rule of law habitually. Grab that slice of Heaven while you still can! Good article, Hasso. I think it’s just another way for them to try and make a buck. Over 90-95% of the time there isn’t a kid to be seen for miles – at any time. Is slowing down for a 1-2 block stretch around a school really impeding your lifestyle on such a scale that it has completely ruined your ability to arrive wherever you need to be by a whole extra minute or less? There are typically early morning and after school activities every day along with additional excusrsions on a less regular schedule around the property and/or neighborhood depending on the setting. Not defnding the writing of the law, lawmakers are usually horrible writers. Just throwing out perspective and looking for better understanding from others than producing FUD in regard to the well being of future generations. If you ask any parent, teacher, or school administrator about the traffic by their school, they will likely say that getting drivers to obey the posted speed limit is difficult to do. So what is more effective at getting drivers to heed the school zone limit? A universal 7-5 period? Or a sign with more specific times? Or something else? We in Albany know that school times change year-to-year and there are early releases on Wednesdays. Someone mentioned WAHS and Memorial, you have two schools with slightly different start and end times. Then just a couple blocks away are Liberty and Takena which have entirely different times. Drivers can pay attention or find another route to drive. It was very simple and enforceable. Used to be, “when children are present”. I was told if you can see children they are present. Not enough money was being collected with the old law so in steps the legislature. They changed it to “at all times”. That was an even bigger mess with it being enforced 24/7 365. People rightly complained so they made a change. It’s now amended to its current status which is better but still a mess. We have criminals running the country and Hering continues to beat this dead horse. Just another tricky day, one supposes. So, you are the self-appointed judge of which people are “normal” and which are not? What happened to what you learned in journalism school? And, calling the school students “little sweethearts” is not even thinly disguised sarcasm and dislike…it is blatant sarcasm and dislike. Are you so incensed about not getting your way on school zone rules that you can’t find something else to write about? I know, I know…I’m being harsh, but you would do the same if you were still the editor of the paper when scolding someone about a letter you refused to print. This rule on Springhill road, near what used to be Fairmont Elementary school, is even more ridiculous. Never see children. Perhaps an occasional ODOT-approved “Open Season.” Brief pop-up periods when all bets are off. The rules of the road abandoned. Self-centered mayhem replaces community sensibility for some short period defined by government. For those few brief moments, all the pent-up anger building inside those who believe their time is more important than anything else, can be unleashed on unsuspecting pedestrians. Imagine the psychic relief. Same with Highland Drive, which runs past Crescent Valley High in Corvallis. School zone speed limit makes no sense there. I’ve noticed that HH’s writing style has shifted quite a bit since I began following a few yeas back. Human interest stories, positively presented were common. Lately, a theme is presented to provoke a negative reaction. Construction equipment have alarms to make people aware of moving equipment. Perhaps we should blast our horns in school zone’s to warn children that they are in imminent danger! 2 – Kids have grown up with this type of noise and most are probably immune to it, so it wouldn’t help anyway.